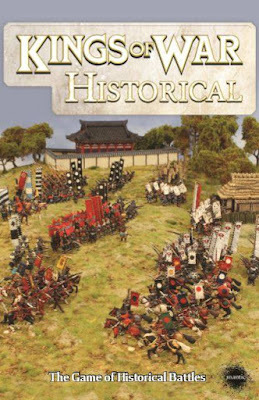 I'm a big Kings of War fan, it is by far my favorite game that Mantic currently makes. Dungeon Saga however looks like a lot of fun as well, though not quite up there. 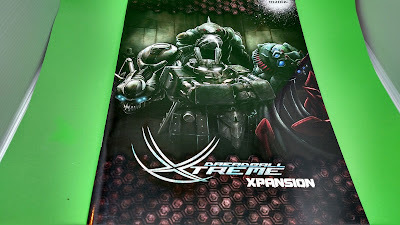 Dreadball is a great game, and while I'm patiently (yeah, I'll claim that) waiting for my Kings of War 2.0 pledge to come in, my final Dreadball Xtreme wave 3 arrived. 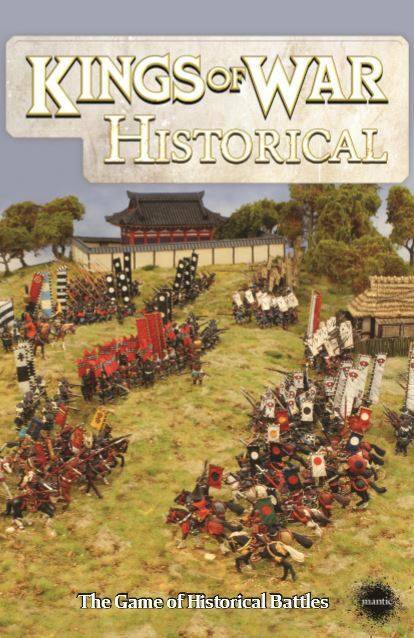 One thing that I haven't seen much of is what some of the actual models and expansions look like. So I figured I'd open the baggies and take a look at some of the new miniatures. In the base pledge, everyone got all the season four teams - then they went and mixed up the seasons. So the mutants and mechanites were moved to season five. This meant that I got no teams in my wave 2 box. First are the mutants. These are one of the more complicated teams, as you have to construct them with specific options. So there is a big bag of parts. What kind of parts? Pieces parts. Does anybody remember that commercial? Anyway, I tried to lay everything out. There are basically 2 of every piece here. 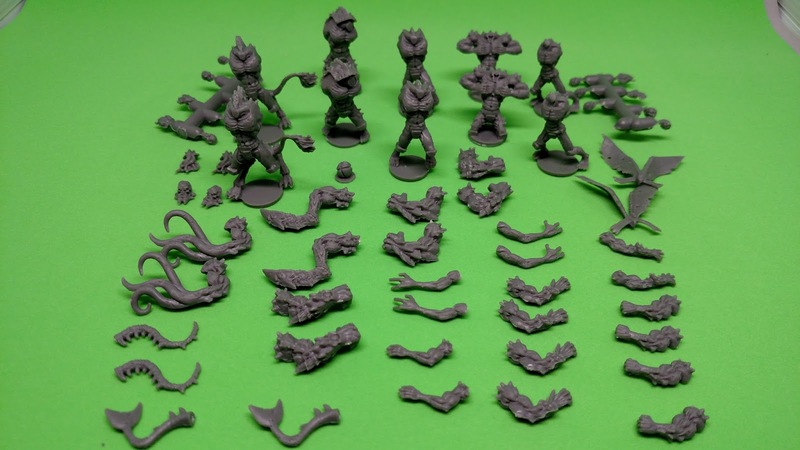 So in the picture at the back are the head sprue, with 3 human, a Judwan, Asterian, Z'zor and screaming head on it (the screaming head is intended for the downed player). The Grogan and Nameless heads were in a separate little baggie, along with human arms. For bodies (left to right), there is a Yndij, then there is one with a bony ridge on its back, another medium size, the prone player (kneeling, ripping his chest open), and then the smallest of the bodies. The only body torso improvement is theYndij, but you could use the others for Skeletal reinforcement or Enhanced muscle density - or just guards, jacks and strikers. 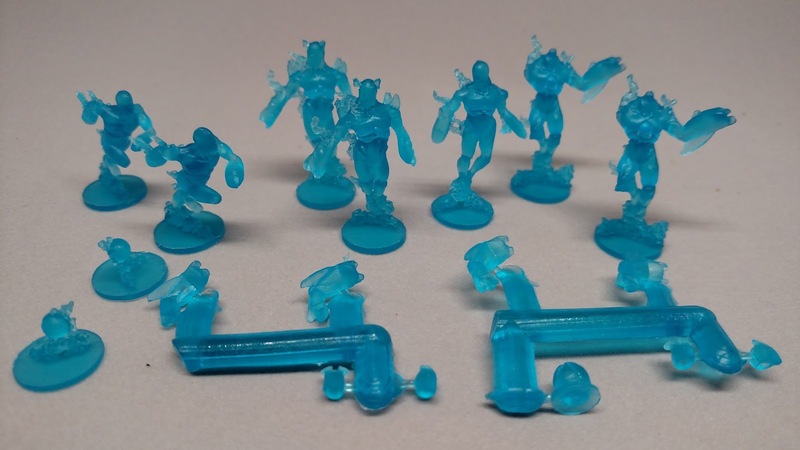 For arms, you get Tentacles (two left arms), Z'zor claw (two right arms) and Teraton arms (two right arms with dreadball gloves, two without, two left arms), two pairs of Judwan arms, four pairs of beefier arms (all the right ones have dreadball gloves), and two pairs of 'human' arms (both rights have db gloves). There does not appear to be any Z'zor blade arms however (though in that aspect I'm lucky, as I have a couple of extra Z'zor from a Christmas crazy box). Lastly are 2 sets of Kraaw wings, two Veer-myn tails and two Sphyr tails. Plus a ball. I have to say, I really like they are giving a ball with each team - these are so easy to lose, it is nice to get extras. Now how to actually build out a Mutant team - yeah, I've not got a clue on how I would even get started there. 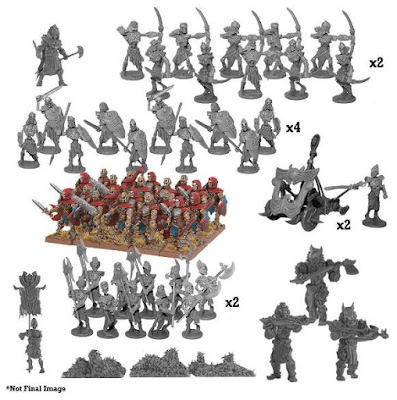 One big question for both this and the mechanites is are there enough parts in a standard team box to make a team that people want to play? In addition is this single kit sufficient for those who want to add upgrades to their existing teams in leagues? 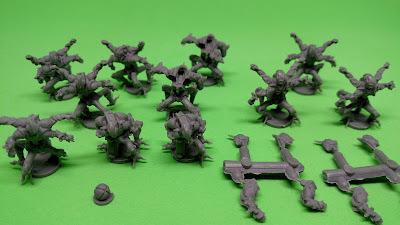 So next is the other team requiring serious assembly, the mechanites. I think these are a bit easier, as each of the pieces has a corresponding drawing in the Season 5 book. I did a team build when these were out for playtest, and pretty much can't do that team with this kit, because I use three or four of some parts. Now I was trying to maximize the team, so maybe the restrictions are good. Once again, you get two of everything, which could already be a limiting factor. First are the quad legs, then the bird legs, then the armored legs, the quad wheels and finally the monowheels. My list had three quad legs, so that is a first change. For bodies, there are two A's, four B's, two C's and two D's. I actually really liked body C because it was so cheap - my list had 3 A's and 3 C's, because of how cheap they were. For heads, there are again two of each. My list had 5 Tanks, because they were cheapest, and one radar. For arms, again two of each. 2 Wrecking balls that could go on either the left or right, 2 left hand air cannons, 2 left hand grabs, 2 right hand hammers, 2 left hand Rams, 2 right hands, 2 left hands, 2 launchers (these could actually work for either hand), 2 left hand claws and 2 right hand gloves. So 4 pairs of right hands, and 5 pairs of left with one pair that can go on either side. For my list I had three air cannons - so one would have to be swapped out. Lastly there are two large armor plates that would most likely be for guards, to reflect their better armor. On the head sprue are also a smaller armor plate (that is for body B) and another smooth one that I'm not sure what it is for. Plus a ball, of course. This team comes with three strikers, two jacks and a two guards (so one can be made into a keeper). 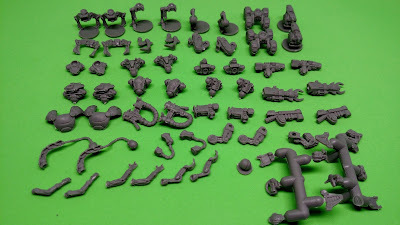 I also got two sprues of guard/keeper arms/heads, one of which had the extra ball. The prone markers are just spheres. These are meant to be a combination of rock and crystals. They have five guards, three jacks, two prone models and a ball. The tricky part painting these will be what parts to paint over as rock vs what to leave as crystal. This team is all jacks (8), plus two prone and a ball. Normally I really hate jacks - but with their ability to move other players (friend or foe) it can make Jacks actually useful. Pick up the ball and you are too far out to score? 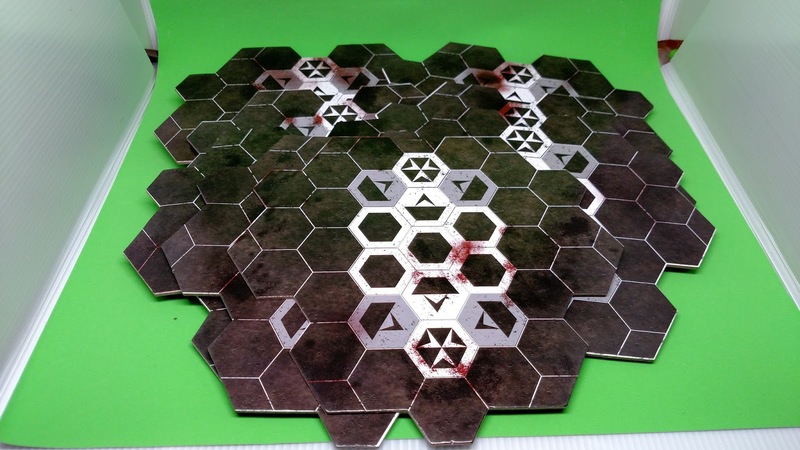 Have a team mate push you two hexes before you throw! Your opponent sets up a castle around the three/four point goal - simply move someone out of the way. This looks like it could be a very fun team to play. These are four armed creatures from another dimension that create portals to transport them across the pitch. Two guards, five jacks and a striker (plus two prone and a ball). 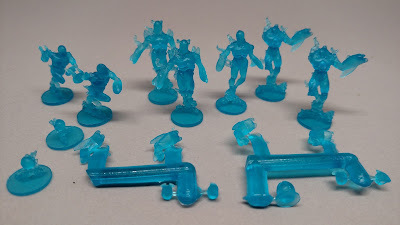 My pack actually had an extra striker in it (but then had no extra guard to make as a keeper, even though there are keeper bits on the guard sprue). The portals look to make this team very interesting to both play and play against. The challenge cup is an interesting expansion, as it is both for Original Dreadball as well as Dreadball Xtreme (4 scenarios for each game). 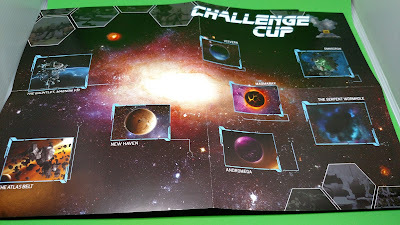 Much like the Azure Forest campaign pack, it is a series of tournament scenarios. It comes with 4 MVPs, but there are actually 8 in the campaign. Eko'o, Hexan, Blitz, and Alo-Khan are the four MVPs that were funded in the kickstarter. 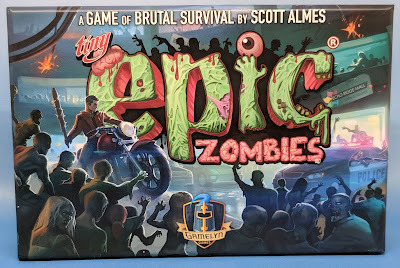 There are four more that do not automatically come with the expansion - Eclipse (add on / Frenzy), Gemini (Dark Twins), 'Big Slick' Slalaran Vesh and Kreed. When / if these last three are made they will most likely be metal. The challenge cup also comes with a small size rule book (it fits in one of the mantic figure cases, a map (I'm not impressed at all with this), two sheets of counters and a small deck of cards. 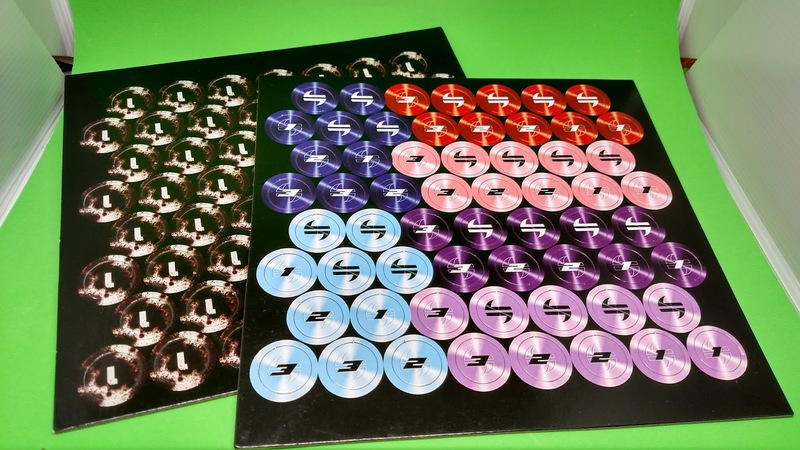 As is typical with their kickstarters, Mantic does not provide commercial packaging for any of the add on's, (i.e. boxes) only for the base game. This is not a big deal for this expansion, since it all fits in a figure case anyway. What I do find interesting about it is that it requires the Xtreme Xpansion for one of the DB scenarios and two of the DBX ones. The Dreadball Xtreme Xpansion is the DBX equivalent to Dreadball Ultimate - it is the three to six player expansion, but also a lot more. 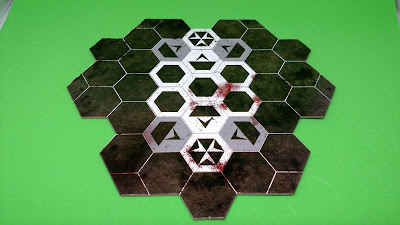 With the new customizable pitch tiles, you can create very interesting and fun new pitches. 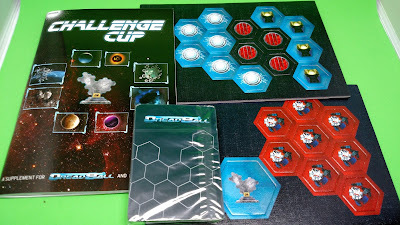 As with the challenge cup however, it does not include the box (commercial packaging). This is a bit of a problem with this however, because it DOES NOT fit in a standard figure case - so it will be slightly problematic transporting all the large tiles. 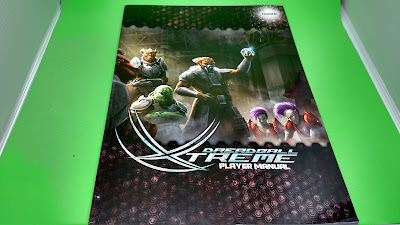 The rule book has rules for using the new tiles and giants, as well as for games with more than 2 players. I haven't read the Xpansion book yet, so I'm not sure what the tokens are for, but my guess is to randomize the turn sequence (just like Ultimate). 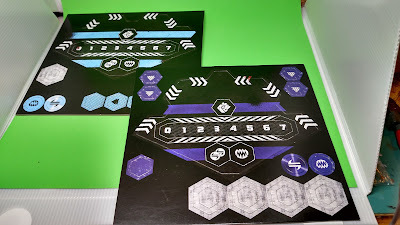 The custom pitch is one of the cool things in the Xpansion - it is done via 8 double sided tiles (one has a side has a strike zone on it, the other just empty hexes. A better view of a tile. Nice and thick tiles. I like that while they could have easily been identical, each is slightly different (if just by the blook splatters). I would have liked to have some of the upcoming Dungeon Saga tile clips however - I can easily see a pitch getting knocked about during a game. Enough cardboard tokens for six new players without re-using the ones in the original box. These are nice. 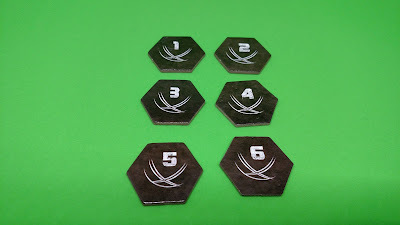 Six colors in two formats (to fit the hex pitch). Each also has the score track and placement areas for your sponsor on it. And speaking of sponsors, you get four new sponsors. 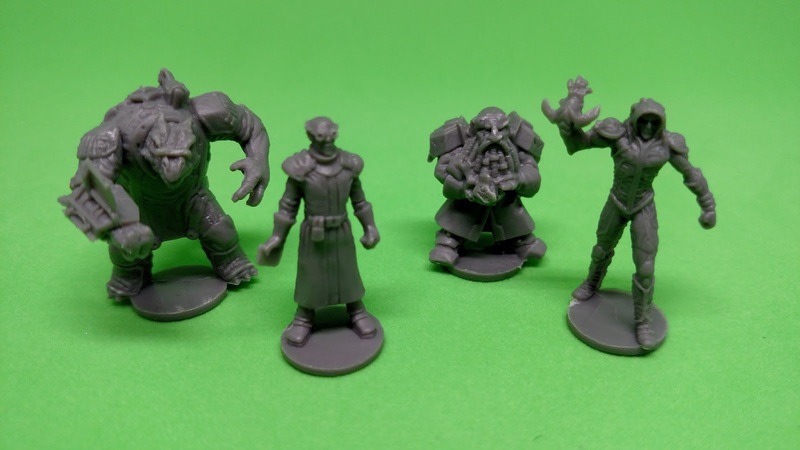 With the two originals plus the Ardia Shi'lek (a kickstarter exclusive) (which is used as an example of building your own) there are now seven sponsors to choose from. These are (l-r) Kraato Gon, Dr. Kain, Rathmar Ul-IHeq and Shojuun. 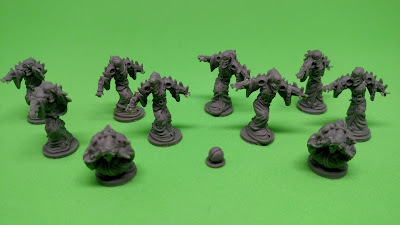 Nice and very characterful minis. Note - they did change Eclipse from a sponsor to an MVP - of course that caused some people to absolutely lose their minds, however I feel it is par for the course. A company HAS to be able to adapt and modify things during development. Plus you could always use that mini as your own unique sponsor if you so choose. Of course of my most favorite parts of the 3-6 player expansions is the Giants. 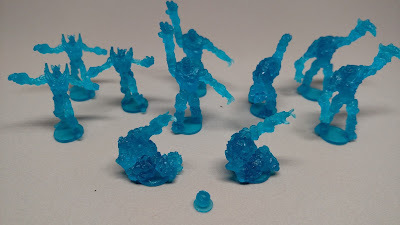 Granted, I've never actually PLAYED with one on a team, but I really like the miniatures. 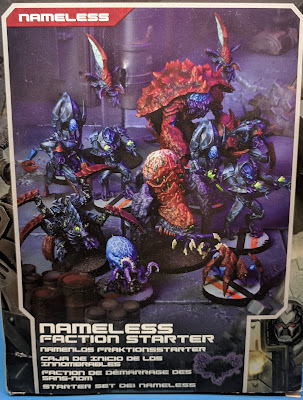 I feel Mantic really outdid themselves with these this time. (l-r) San-Gar, Krastavor, Iron Ancestor and Chovar. 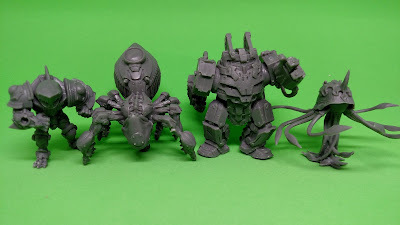 These are such awesome models - especially Krastavor. This was a stretch goal that wasn't reached in the kickstarter, however Mantic made and included him anyway. 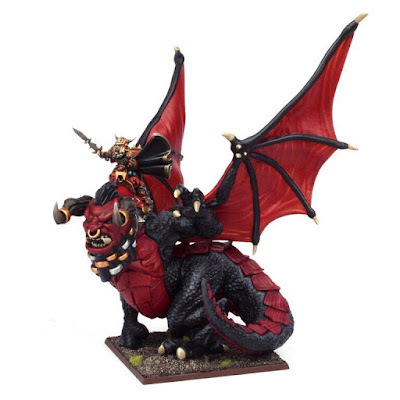 He may get moved to the top of my painting queue just because I love the mini so much. Last is probably the most important thing added to Xtreme - the Player Manual. This has the rules for the new sponsors, as well as how to make your own unique sponsor. And then it has all the rules for EVERY dreadball mini through season 6, including MVPs!! This is what is going to make Xtreme as a game - it is just too limited with only the two teams and free agents it comes with. This opens up so much for play, I can really see it taking off, and even a tournament scene growing around it. (Though it will be murder for TO's to check lists). And that is what was in the box.